Product #18557 | SKU V-4EX | 0.0 (no ratings yet) Thanks for your rating! 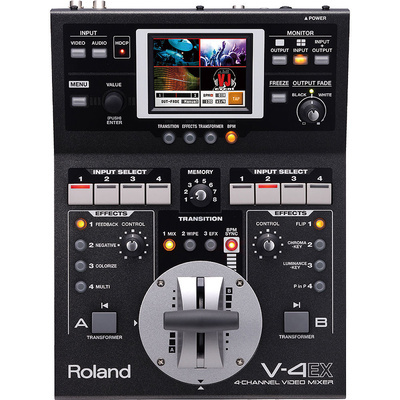 The Roland V-4EX Four Channel Digital Video Mixer with Effects is a live production switcher and web streaming device that improves on the Roland V-4 Video Mixer by adding a built-in multiviewer with touch control screen and HDMI in/out, with 1080p/RGB WUXGA (1920 x 1200) support on one input, and 1080p output. You can switch between four video sources and deliver via HDMI, RGB Component, composite video and stream via the built-in USB port. Four built-in frame synchronisers, one per input, allow you to support and cleanly switch input video from sources that are not gen-locked. This unit is well-suited for clubs, concerts, worship, events, weddings, education and sporting events. The V-4EX features a built in Keyer for Luma, Chroma and PIP keying effects, including the 259 transition and 148 built-in effects. The switcher features a familiar analogue T-bar transition controller with a choice of three transition curves and the T-bar itself can be rotated for user comfort without affecting its operation. The built-in audio mixer accepts audio embedded in the HDMI stream, or from an unbalanced analogue source via the two RCA jacks, and embeds the mixed audio in the HDMI output stream. You can also delay the audio by up to 4 frames to adjust the "lip sync" of your video. The built in multiview screen can show your four inputs on the screen at the same time and you can transition from one camera to the next by merely touching the camera view on the monitor screen. The V-4EX features an output scaler that can scale your video to 1080p or 1920 x 1200 via the HDMI/RGB output. The programme feed is available for streaming or capturing to a computer via the USB Type B port on the unit. Inputs 1 to 3 feature composite (BNC) or HDMI while input four accepts HDMI, RGB/Component or S-video. Input 4 can accept 1080p input signals via the HDMI connector. Programme output is available via the composite (BNC), HDMI or RGB/Component 15 -pin connector. HDMI output is scaled up to 1080p, and 1920 x 1200 is available through the 15-pin connector. Additionally, you can stream the programme output for the web through the USB port. The V-4EX processes input video signals at SD resolution using 8-bit progressive internal processing with a colour sampling rate of 4:2:2 (Y/Pb/Pr). The mixer also features audio resolution of 24-bit/48 kHz. Featuring one frame synchroniser per input, the V-4EX allows you to input video from non gen-locked sources and still seamlessly switch between them. The V-4EX features a selection of 148 digital effects including colourise, strobe, mirror, multi-screen, negative, shake, afterimage and silhouette. It also features composition effects such as picture-in-picture, chroma key, and luminance key. A single button press can recall the effects, and you can modify select effects using the panel mounted control dial. 259 transitions (wipes) are available to you to switch video from input A to input B. The built-in multiviewer can display all active inputs on the same screen on the V-4EX. You can select input sources by simply touching the image you want to select on the built-in screen. The built-in memory function allows the memorisation and convenient recall of panel settings, such as effect assignment to each button. The memory stores up to seven configurations and keeps stored settings even with the power off. The preview function allows monitoring of each of the four input sources or the output source, or the output can be overlaid on top of the four input sources on the built-in multiview monitor. Major functions can be viewed on preview screen using the convenient on-screen menu. The V-4EX supports remote control by MIDI or USB and can be operated remotely from an external device that supports MIDI Visual Control. Use this feature when you want to perform switching on the rhythm of background music. By default, switching is performed at 120 BPM (beats per minute). The V-4EX is HDCP compliant, although you have to enable HDCP using the menu system. Video Processing 8-bit progressive processing at: 480/59.94p when set to NTSC, and 576/50p when set to PAL. 1: The output format of HDMI and RGB/Component is always the same. 2: When an interlaced format is selected, component signal is output from the RGB/COMPONENT connector. 3: When a non-interlaced format is selected, RGB signal is output from the RGB/COMPONENT connector. 4: The refresh rates of RGB format is 60 Hz when set to NTSC. 6: The refresh rate of 1600 x 1200 and 1920 x 1200 is 75 Hz when set to PAL.